The great Irish poet and Nobel laureate Seamus Heaney is dead at 74. His death was announced with “profound sorrow” by his publishers Faber. “His impact on literary culture is immeasurable,” Faber said. “He was nothing short of an inspiration to the company, and his friendship over many years is a great loss.” Friend and fellow Irish poet Paul Muldoon said Heaney died in hospital after a fall a day earlier. American poet Robert Lowell described Heaney as the most important Irish poet since Yeats. Heaney was a household name in Ireland and his 12 major collections did well commercially. He was on the school curriculum and I remember his brooding poems from the 1970s singeing their way into my growing political conscience. Heaney was also a successful broadcaster and journalist and in 1995 he was awarded the Nobel Prize in Literature “for works of lyrical beauty and ethical depth, which exalt everyday miracles and the living past”. Seamus Justin Heaney was born on April 13, 1939 at Mossbawn, near Castledawson, Co Derry. His yeoman father Patrick owned a 40-acre farm and was a dealer in cattle and a taciturn man. Seamus would write about his father’s “lifelong speechlessness” and a gagging common to many that would later explode into violence between Catholic and Protestant communities in Northern Ireland. Seamus’s mother Kathleen also fit an Irish stereotype of a warm, generous and imaginative woman. She bore nine children with Seamus the eldest. On her deathbed in 1984 the poet recalled a scene when they were cooking while the rest of the family was at Mass. “I remembered her head bent towards my head/Her breath in mine, our fluent dipping knives/never closer the rest of our lives”. Heaney grew up in a world where Catholics and Protestants mixed and generally lived in harmony. He attended the primary school at Anahorish which catered for both creeds, unusual for Northern Ireland. Yet he could not avoid looking at the Ulster border on a map of Ireland as a “vestigially bloody marking”. Heaney was the beneficiary of the enlightened 1947 Northern Ireland Education Act aimed at bright children from disadvantaged backgrounds. He won a scholarship to St Columb’s College, Derry. There he mixed with fellow poet Seamus Deane and politician John Hume. St Columb’s was a harsh environment but Heaney thrived academically. He won a second bursary to study at Queen’s University Belfast. At this bastion of Protestantism, Heaney sought out the Catholic Sodality and the GAA ceilidh. But the curriculum laid stress on British culture which saw him finding his way among “Jane Austen’s vicarages, discussing Tennyson’s loss of faith and Lawrence’s phallic conscience”. This grounding in the canon helped make his Irish poetry accessible to English audiences. Robert Frost was another huge influence and like the American poet, the young Irishman witnessed the tension between the ancient craft of the land and modern education. Heaney published his first poems in his third year at Queen’s in the university’s literary magazines showing the influence of Frost but also of Dylan Thomas and Gerard Manley Hopkins. He graduated with first class honours in English language and literature in 1961 and after a course at St Joseph’s College of Education, got a teaching job at a secondary school in Belfast. Heaney then discovered the Irish writers Patrick Kavanagh, John Montague and James Joyce. Kavanagh had a similar background to Heaney and his book The Great Hunger would become a major influence. “Kavanagh gave you permission to dwell without cultural anxiety among the usual landmarks of your life,” Heaney wrote. Montague showed Heaney how to write about the complexities of Northern Ireland while Joyce freed him of his “linguistic inferiority complex”. In October 1962 Heaney met schoolteacher and fellow writer Marie Devlin at a party. He loaned her a book, A. Alvarez’ anthology The New Poetry and asked her to return it a week later. They married three years later. The same year his Eleven Poems were published to coincide with the Belfast Festival of the Arts, and were well received by London critics. His 1966 collection Death of a Naturalist, based on his childhood, brought the attention of the wider world. As Heaney and Marie started a family, the political situation in Northern Ireland deteriorated, and the Civil Rights movement took its inspiration from the US. Heaney was politicised by Stormont’s hostility to the movement. In 1969 Heaney published Door into the Dark including “Requiem for the Croppies”. Requiem harked back to the failed 1798 rebellion but lines like “A people hardly marching… on the hike/We found new tactics happening each day” spoke to the worsening situation in Belfast and Derry. Heaney had a hiatus from the unfolding tragedy with a sabbatical from Queen’s to be guest lecturer at the University of California, Berkeley. Heaney used his time in the US to connect circuits between the Old World and the New. He returned to Ireland and in 1972 moved to Carysfort College in Dublin. His literary reputation grew with the collections Wintering Out and North. North showed a new and darker tone as Northern Ireland spiralled out of control. He told an ITV documentary Northern Ireland was “a society, if you like, that’s fallen from grace. This is limbo land at best, and at worst the country of the damned.” In Funeral Rights he wrote “Now as news come in of each neighbourly murder/ we pine for ceremony,/ customary rhythms:/ the temperate footsteps of a cortege, winding past / each blinded home”. 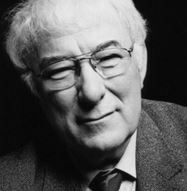 In the eighties Heaney worked at Harvard before being elected professor of poetry at Oxford in 1989. In 1995 came the Nobel award. In his acceptance speech Heaney recalled Yeats “on this platform more than seventy years ago” when Ireland was emerging from the civil war and war of independence. Yeats barely alluded to either war in his Nobel speech talking instead about the Irish Dramatic Movement. Heaney had no such inhibitions and said change in Northern Ireland was long overdue. “It should have come early, as the result of the ferment of protest on the streets in the late sixties, but that was not to be and the eggs of danger which were always incubating got hatched out very quickly,” he said. With the election a week old, I thought it was time I re-read the Advisory Guideline on Reporting Elections from the Australian Press Council. But as much as I tried to take it seriously, I couldn’t help chuckling after reading the first section headline on “newspaper bias”, I immediately conjured up a vision of Rupert Murdoch or Col Allan snorting and enjoying a good belly-laugh in the unlikely event they ever read this section together. Murdoch brought Allan from New York to report this election in the way the owner wanted, not the way APC wanted. Both men would agree with the first sentence in the advisory guideline. “The Council,” it began,”upholds the right of a newspaper to have its own political position, to accept certain beliefs and policies and to reject others; and to favour the election of one party and to oppose the election of another.” The sub-clauses were a bit unnecessary but it was a sentiment most owners would agree on however at odds with the codes of conduct for broadcasters. The second sentence was more likely to attract guffaws from Murdoch and Allan, saying newspapers which claim to inform people on politics had an obligation “to present to the public a reasonably comprehensive and accurate account of public issues”. The News Ltd bosses would immediately tell you their newspapers are under no such obligation. Their only obligation is to their own survival in tough times. The spate of anti-Government front pages in the Murdoch tabloids since Rudd called the election serve political and commercial purposes. The political aim is to overthrow a government Murdoch does not like. The commercial one is to increase newspaper circulation by having their ideas front and centre in the supposed zeitgeist to bump an unpopular government. In either purpose, the Australian Press Council is not a consideration. This is despite the fact News Ltd is a constituent body and accept their jurisdiction. They know the APC is a pale ombudsman. The complaints procedure attracts at most a mild censure, that is at the paper’s discretion to publicise widely. If all the APC wants is to keep the paper’s editorial viewpoints and advocacy separate from its news columns, News Ltd could simply claim their openly biased call to action front pages are easily identifiable as advocacy. It is not just the front page that are calls to actions. The signs outside the newsagent saying Kick this Mob Out are neither an “an editorial viewpoint” nor a “news column” but simply a blatant ad for a political party. The open cynicism was probably too much for a corporate flak like Kim Williams, but when push came to shove, it was Williams that was shoved, not the campaign. It shows the Press Council as a joke again, in a year when News successful fought against its reform. When it comes to the nitty gritty of what the council demanded when it comes to “unfairness and lack of balance”, News were abysmal failures. The APC calls for equal space for parties, equivalent photography, a selective right of reply and a “balancing response”, none of which the Government is getting in the election campaign. Yet breaches of these demands could all be easily be batted away by an experienced company lawyer who, in the worst of circumstances might simply advise to take the censure of a mild slap on the wrists. The Murdoch campaign is rich irony for Labor. It was their idol Paul Keating who got them in this mess. His infamous “princes of print or queens of the screen” line which allowed Murdoch a 1987 Herald and Weekly Times takeover left Keating’s party horribly exposed should the princes of print decide to exercise their royal privileges against them. Whatever about his unimaginative failure not to predict media convergence, Keating had no excuse for not predicting likely bias given he saw first hand how Murdoch destroyed Gough Whitlam in 1975. This supine acquiescence a quarter of a decade ago may be enough in 2013 to haunt his party into opposition in a tight election.